Hundreds of people enter the care system every week in England, but there are concerns that few are ready for the expense. At present, people with assets of more than £23,000, often including the value of their home, do not get any help in paying for full-time care. The government has announced plans to increase this threshold to £123,000 - but, even so, many of those who own a home will still have to pay for care. Those who only need some help with everyday activities such as washing or dressing themselves are among these "self-funders" if they have savings of more than £23,000. About three-quarters of 65-year-olds will need care at some point in their lives, the Association of British Insurers (ABI) has said. Yet a survey for the ABI found that half of those asked were not sure how they would pay for these care costs. And despite the £75,000 cap the government has announced from 2017 on what people will have to pay for their own care, many individuals in need of help will have to raise a significant amount of money. The affluent should still be able to cover the costs with income from pensions and investments. The poorest should still receive assistance from their local authority. So, it is those in between who will have to consider how to fund their care. So what options do they have? Pretty much everyone in older age is entitled to some financial assistance, yet millions do not claim all the benefits that they are entitled to. There are a string of benefits from the state, ranging from the state pension to various disability allowances, that might make an initial difference to the bill that self-funders are facing. There are some opportunities for funding care from the local council or the health authority, so experts say these need to be exhausted before getting into other, sometimes more complex, financial arrangements. Advice charities such as Citizens Advice can help to ensure people have claimed all the benefits they are entitled to. Some charities might even assist with care costs. For many people, this is exactly the scenario they want to avoid. They have paid off their mortgage and hope that their home will be an inheritance for their children or grandchildren yet, faced with a large bill to go into a home, they have to sell up. Some people will argue that it makes sense to sell a big family home, rather than getting their relations to pay for their care. This, of course, will not be an option for everyone, and it is a scenario that the government wants people to be able to avoid anyway. Some might decide to downsize, especially if they want a home that is more manageable if they receive help domestically, rather than having to go into a home. Clearly, selling up and moving on is a major financial upheaval, and could take some months to complete. This deals with the delay for those who have to sell their property to move into a care home or they do not want to sell it immediately. 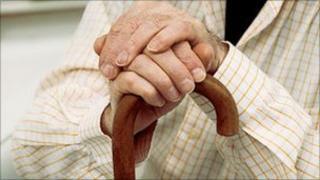 A local authority will pay the care home fees, then recover the payment when the home is eventually sold. This might be when the owner dies, allowing for it to be rented out in the meantime, which could help with the care costs. However, this option is only available if the resident has insufficient income to pay for residential care and has savings of less than £23,250 excluding the value of the property. It is also entirely the choice of the local authority as to whether an individual is approved for the scheme, and it may affect their benefit entitlements. This is described by consumer group Which? as an option when all others have been exhausted. It is aimed at the "property rich, cash poor" and allows people to borrow a proportion of their property's value which is paid back, with interest, when they die or sell their home. It does mean that an owner does not need to sell their home, which gives them greater flexibility if they are in and out of care. Any released equity which remains unspent when the owner dies goes to their inheritors. Steve Wilkie, director of Responsible Equity Release, says about 7% of their business is prompted by people looking to fund care costs, but he says it is not a decision to take lightly. "It will cost you to set up - roughly £2,000 plus the roll-up of interest on the equity release plan. You need to plan ahead. It is not a decision to take on the spur of the moment," he says. Financial experts will say that the key to saving for costs in older age is to start saving early. Compound interest - when interest added starts to earn interest itself - means that it is better to put away a little for many years than a lot in later life. People could put money aside when they are working into an Individual Savings Account (Isa), which is tax-free and can be saved in cash or invested in stocks and shares. Phillip Bray, of independent financial advisers Investment Sense, says that workers can also ensure they have a good pension plan in place - personally, or through their workplace - and make sure they have enough National Insurance contributions built up to be entitled to the state pension. An annuity is a pension income for the rest of your life, bought with an upfront lump sum of savings or investments. The specialist product here is called an immediate need care fee payment plan. It is provided by an insurance company and guarantees an income for long-term care, but is only available to those already in a care home or just about to move into one. The price of a plan is based on how much income will be needed and the insurance company's assessment of how long it will be needed for. Advisers say independent advice is important before buying one. The main reason for this is that there is no way of going back. Those with an annuity cannot reclaim the upfront investment if, for example, they find they stop needing care. Malcolm McLean, of the actuarial firm Barnett Waddingham, says that it is often possible to take a cash lump sum from a pension plan on top of, or sometimes instead of, an annual pension. "There are no restrictions on how this money can be spent," he says. So, the options include delaying drawing a state pension for at least 12 months in return for a lump sum later on. Personal and workplace pensions often allow taking up to 25% of a pension pot in tax-free cash from the age of 55. Small pension pots may be taken entirely in cash. Those who are seriously ill may also be able to take their pension in cash if an assessment confirms that they are expected in die in the following 12 months.